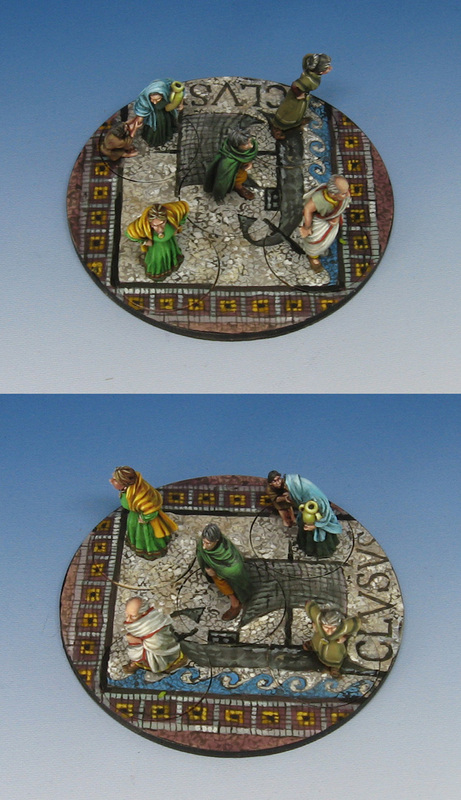 This is the second mob painted for the Gangs of Rome game. These are groups of five figures that can react in various random ways to the mortal combat going on in the streets around them. When you look at the individual figures in each of these mobs, you start to see some interesting characters. I did some Google image searches on Roman fashions and mosaics. You have already seen the previous posts regarding the bases. 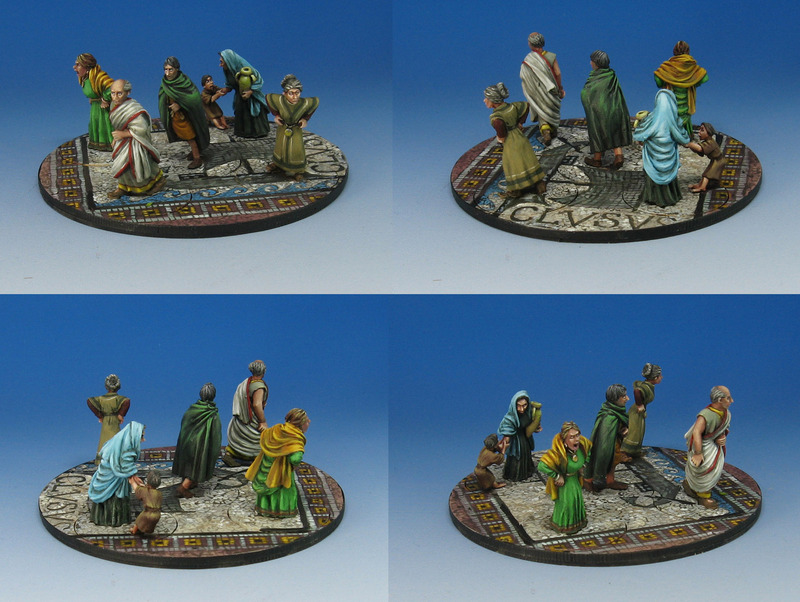 In the same way I had to guard against getting too elaborate with the mosaic patterns, I could not get too "busy" with the figures themselves. Without even realizing it, this became the green mob. This allowed me to make the Senator stand out even more, despite how mostly white robes. That bit of red could contrast with all of those shades of green, while the occasional tan colors would tie in to those on the base. The veil of the lady with the jar was made light blue to do the same thing... tie into the blue wave of the base. 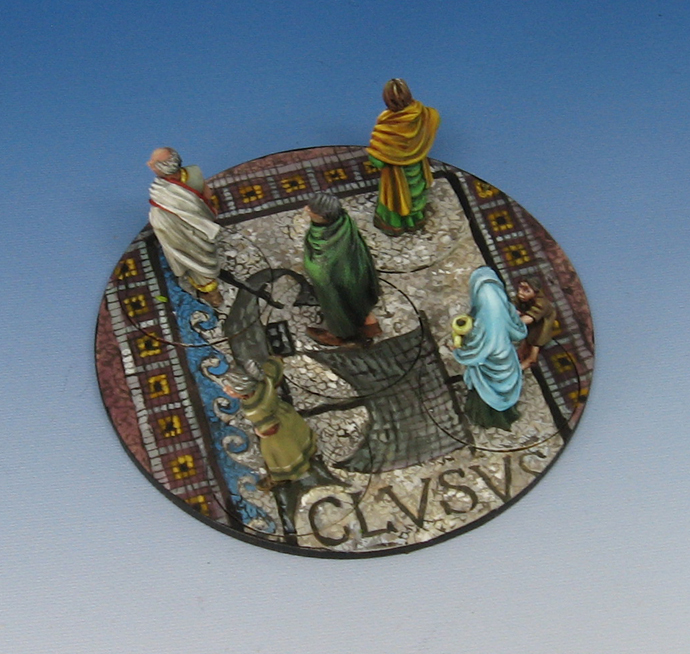 In future posts you will recognize bits and pieces of these overall patterns on the gladiator bases. After all, they are supposed to be walking down the same hallways and streets! 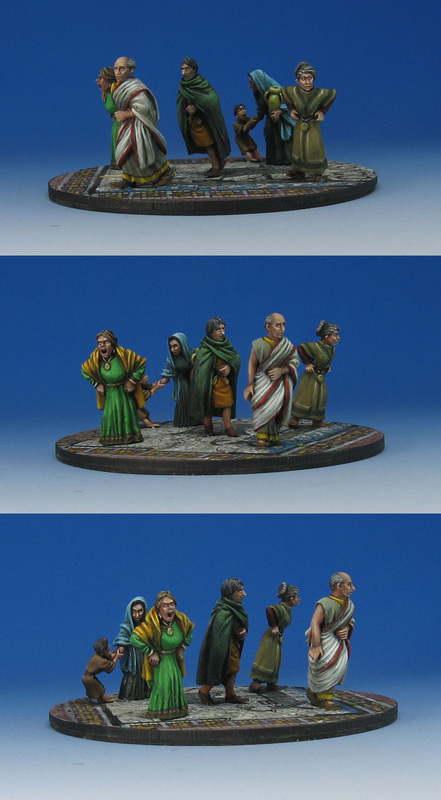 The first time I saw these "street level" views I noticed the individual character of the figures much more than when I was painting them! You can tell that a few of the citizens are less than pleased with the mayhem taking place. When I looked for the various Roman fashions, there was a lot of 'trim' on the edges, in a few repeated patterns. They were quite a bit more colorful than I originally anticipated. The temptation to go wild with all kinds of colors and patterns had to be resisted, since there was already a great potential for visual frenzy. 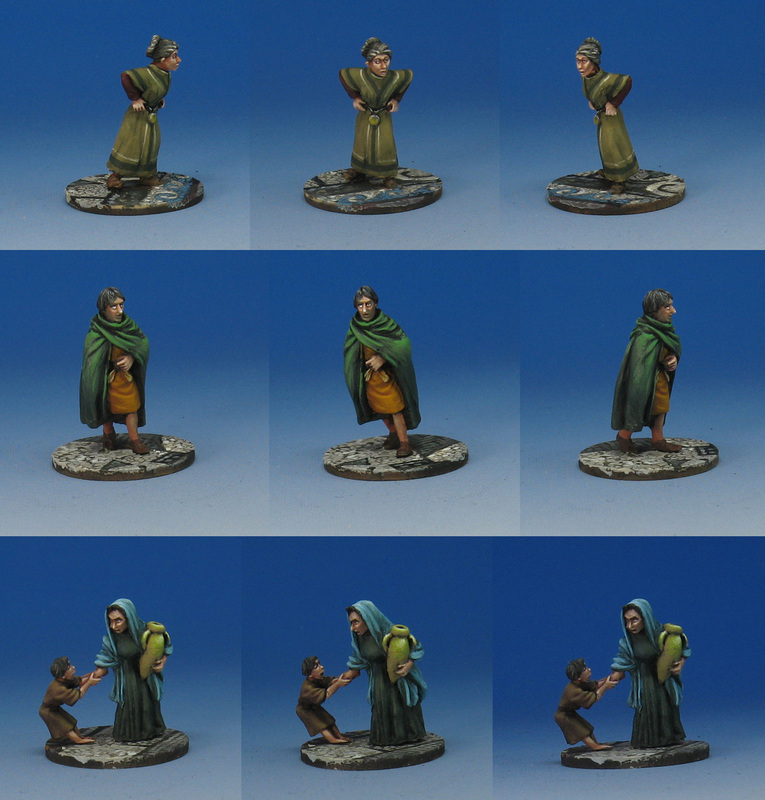 I also did not want the expressions of the figures to become secondary. Keep in mind as well that most of the skin tones were painted in oils. That was the easiest way to do that on 24 figures all at the same time! This lady in particular seems to be someone that not even a gladiator should cross. Meanwhile, a hapless Senator appears to have lost all control of the situation! Stay tuned for much more from the latest new game from Warlord Games. 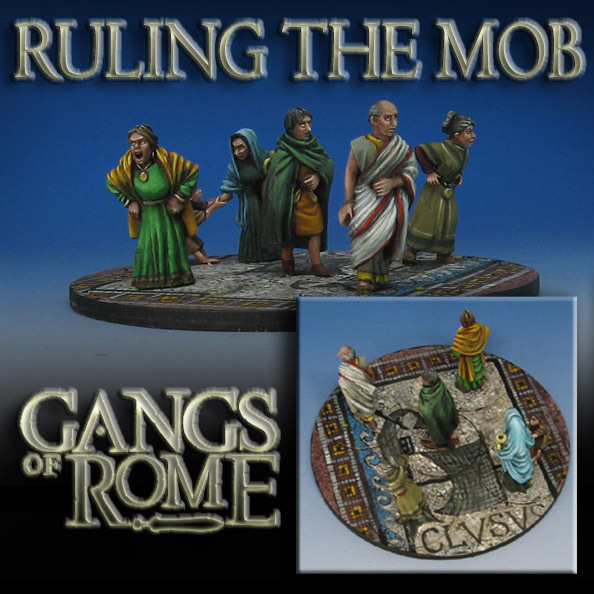 You can check out the Gangs of Rome Facebook group to see more info, and check out the nifty terrain that they are creating too.